And I was hoping that I could get some help, Because I really want to get better. I'd really appreciate some C+C, Mostly on Deathstroke, but anything would help, Thanks. I was going to edit your Deathstroke animation but it seems like you uploaded a bigger version of the picture. Do you have the original size? Some tip: make the foreground of the Deathstroke lighter and the background darker. The way you have it now it is hard to make out the right hand. Also, look at some youtube clips on how to shade to make shapes more clear (I like this one: https://www.youtube.com/watch?v=-dqGkHWC5IU). All your work looks very flat right now. Do you mean the foreground as in Deathstroke himself? I'll work on that after I watch the video, I appreciate the link. The fire reflection on the hollow was fun to make, but I still feel like there's something wrong with it, but it's probably how lackluster the fire itself is. I tried to make and edit but kinda failed. I post it even though it did not turn our very well, Perhaps you can find something useful..
Anyways, As I said before I think you should focus on shading to give your pixel art some depth. Okay, I see what you meant with the foreground/background thing. I'll definitely have to stumble a bit before i can get my shading good, but thank you. The key to depth is contrast. It's usually better to exaggerate the darkness value of the deeper arm/leg, etc., as that provides the illusion of more depth. Look at Street Fighter Alpha 3 sprites and look how light and dark their lightest light and darkest dark are compared to one another. I know this isn't the style you're going for, but they provide some great fundamentals on shading contrast, among other things. While trying to work on/learn shading and contrast, I decided to make The Blue Bomber. I'm a lot happier with how he turned out than any of the other stuff I've made so far, But I know he can definitely be improved upon. I think it's good that you've moved to something more simple, because learning animation and pixel art at the same time is very demanding. Note, I only messed with the luminosity values here. the yellow/blue example illustrates that pretty well. Not that your point doesnt stand anyways. 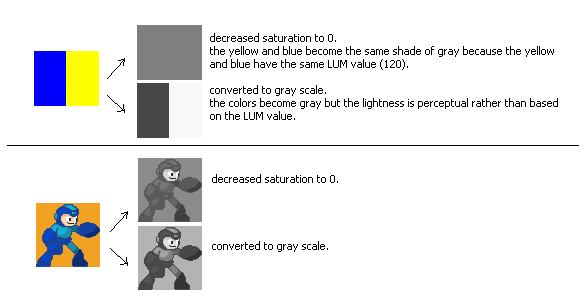 Main problem Im seeing is that the outline color used for the dark blue parts is nearly the same value as what its outlining, while it ought to be darker. Ah, you're right, of course. I just wanted to avoid doing an edit with colours, because then people just try to use similar colours as the edit, instead of experimenting a bit. But I fumbled it up converting to gray scale in GIMP. Thanks!